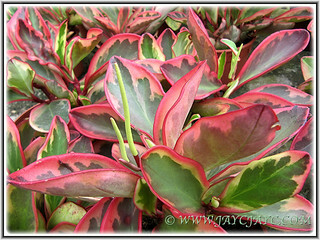 Would you not be tempted to add this uniquely coloured Variegated Red Edge Peperomia to your garden collection? We were definitely swooned over by its amazing psychedelic colours when we first sighted numerous pots of them at Cactus Point in Cameron Highlands last October 2013. A small pot costs us just RM5, dirt cheap right? 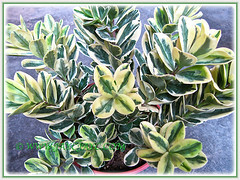 It is one of the most impressive variegated forms of the Peperomia group that we’ve ever come across. The leaf blades are wonderfully adorned in various hues of green, ivory or cream and rosy-pink, and are beautifully bordered in red to show off their beauty. Each obovate and concave leaf is uniquely patterned. The good news is this smallish plant is still thriving well in our garden slightly more than a year later, though foliage is not that vibrant as located at the porch that’s not receiving much sunshine. Nevertheless, we’re delighted with its on-going beauty in our garden. Anyway, looks like I’ve to move this potted plant in a sunny location. Its green counterpart, Peperomia clusiifolia has rather large spoon-like dark-green leaves that are slightly concave in the centre and have a characteristic red margin. Etymology: The name Piperaceae is likely derived from the Sanskrit term pippali, which was used to describe long peppers. Origin: Peperomia clusiifolia is native to tropical America, whilst ‘Jellie’ is a cultivar. 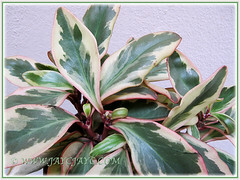 Features: Peperomia clusiifolia is a favoured species of the genus, Peperomia that consists of more than 1600 species of perennials that are concentrated in Central America and northern South America. ‘Jellie’ is a one of the most astounding variegated cultivar that is popularly grown. It is a stiff, upright perennial with obovate leaves that are slightly concave. It is dwarfish, compact and hardy. 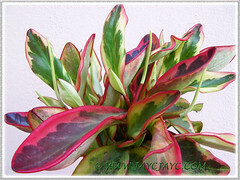 ‘Variegata’ has red-margined, cream-variegated leaves. It produces greenish white, panicle-like flower spikes, though they are grown primarily for their foliage. Image of some other cultivars are shown below. 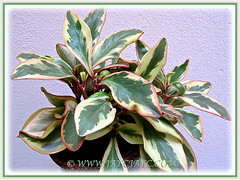 Culture (Care): The Peperomia clusiifolia ‘Jellie’ or Variegated Red Edge Peperomia grows easily with minimum care. Light: Part shade to part sun, although more intense light will result in vibrant and varied colour hues to the foliage. Moisture: Moderate water needs. Drought tolerant. To water only when the top soil is dry. Soil: Adaptable to any well drained soil types, like sandy or sandy loam soils. Others: Feed once monthly with a balanced liquid fertilizer. It likes to be a little pot bound. Prune off flowering spikes to maintain a pleasing appearance as its lovely coloured foliage is the main attraction. Propagation: From leaf or tip cuttings. 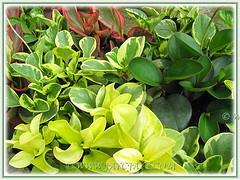 Best from tip cuttings for variegated species. Usage: As a potted plant, or as a ground cover, houseplant indoors with bright light, greenhouse plants and garden plants. Mama used to grow peperomia as a house plant. She would have loved this cultivar. Lovely clicks, Jacqueline. Hope you’re well. Jean Campbell…. thanks for sharing. 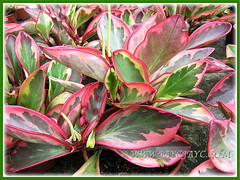 Indeed, this is a gorgeous and colourful cultivar that adds beauty to your garden and indoors. Sokehah Cheah… thanks for concern. I’m coping rather well with God’s abundant grace and mercy. Oh what a pretty plant, havent seen you online for a while. I hope you had a very happy christmas and I wish you both a New Year filled with much health and happiness. Gorgeous plant indeed. Yes, I haven’t been posting any article on my website for sometime due to my ill-health. Much thanks for your wishes. May your New Year 2015 be filled with God’s overflowing blessings and goodness, esp. peace, joy and good health for you and your loved ones. Glad to see you back on the blogging trail after quite sometime. Hope all is well. Seasonal greetings and all the best for 2015. Hello, jacke … is a very beautiful plant, thanks for display. Blessings. Hi Yara… you’re most welcome, very beautiful plant indeed. God’s abundant blessings always to you and your loved ones too. Hi Ravi… coping with my illness with God’s abounding grace and mercy. Thanks for your concern and blessings. May the New Year 2015 be a blessed, joyful, successful and fulfilling year for you.